Okay Airways (Chinese: 奥凯航空有限公司;) is an airline headquartered in Shunyi District, Beijing , People's Republic of China. It operates passenger charter services and plans to expand into scheduled passenger and dedicated cargo services. Its main hub is Tianjin Binhai International Airport in Tianjin . Flights were suspended for one month beginning on December 15, 2008, due to a dispute between the carrier and its shareholders. Okay Airways was established in June 2004 and in February 2005 received an aviation carrier business license from the Civil Aviation Administration of China (CAAC). It is China's first private sector airline. The carrier's maiden flight from its base in Tianjin to Changsha was on March 11, 2005, with 81 people on board. 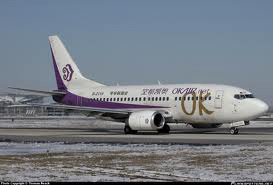 On 25 February 2005 Boeing announced that Okay Airways had received its first Boeing 737-9B5, becoming the first Chinese airline to operate the largest model of the Boeing 737 family. The airline is sub-leasing 2 Boeing 737-900s from Korean Air. These have now been replaced by the two Boeing 737-800 aircraft leased from International Lease Finance. 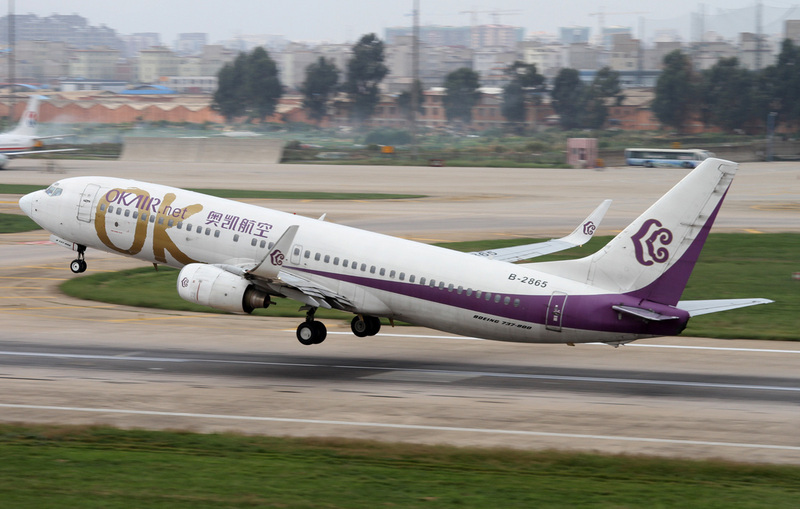 The airline signed a letter of intent for 30 Xian MA60 aircraft. Once the order is confirmed, delivery schedules will follow. During the 2010 Farnborough Airshow, Okay Airlines ordered ten additional Boeing 737-800 aircraft. Okay Airways's passenger routes include from Tianjin to Changsha, Chengdu, Haikou, Hangzhou, Harbin, Hefei , Kunming, Nanjing and Zhangjiajie. Its cargo destinations include Beijing , Guangzhou, Hangzhou, Qingdao, Shenyang, Tianjin , Dalian and Xiamen .